This system was visited for the first time on EDSM by AndySpawn on Jan 11, 2015, 1:18:41 AM. 1666 ships passed through T Tauri space, including 1 ship in the last 7 days. 0 ship passed through T Tauri space in the last 24 hours. The Hind Mine asteroid base was constructed in 3303 by Taurus Mining Ventures. 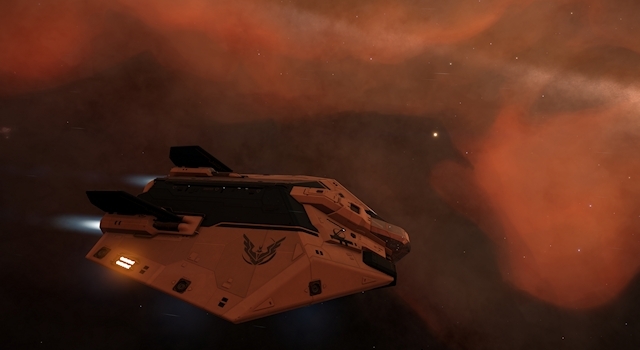 It is in the T Tauri system - orbiting the star that illuminates the Hind's Variable Nebula. This base was used as a supply depot for the Premonition Allied Coordination in the hours leading up to their mission to defend Salomé. NGC 1555, sometimes known as Hind's Nebula, is a variable nebula, illuminated by the star T Tauri, located in the constellation Taurus. The nebula was discovered on October 11, 1852 by John Russell Hind. It is a yellowish/orange nebula and when viewed from within the T Tauri system, part of the nebula resembles the shape of a bird in flight. The Hind Nebula was the destination of one of the early research voyages organized by the First Great Expedition - making it one of the first nebulae to be surveyed by group exploration (source).